Outlined in our Signature Stats Glossary, pass-blocking efficiency has been talked about since we at Pro Football Focus started tracking every player on every play of every game. Effectively measuring pressures allowed on a per-snap basis, here are how all 32 NFL teams stacked up last year in terms of PBE, with an eye towards their 2018 season and whether they can replicate, or better, their 2017 season. The Saints ended the 2017 season ranked first among offensive lines with a PBE of 84.6 as the unit allowed 15 sacks, 26 hits and 69 quarterback hurries on 559 passing plays. The Saints were anchored by veteran center Max Unger, who played 100 percent of the team’s offensive snaps, doing so for a third consecutive year and allowed just 14 pressures all season. Rookie right tackle Ryan Ramczyk also enjoyed an excellent season, as he earned a pass-blocking efficiency of 96.6, the fifth-best mark ever recorded by a rookie tackle. 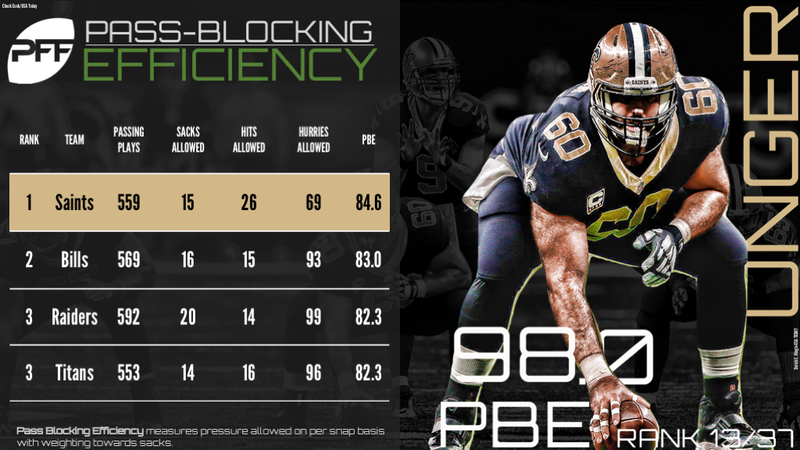 With the Saints set to enter the 2018 campaign with left tackle Terron Armstead back to full strength, it would not be a surprise to see the Saints top this list once again. Last season, the Bills saw great performances from veteran Eric Wood, who allowed just 16 quarterback pressures on 664 pass-block snaps at center, and Richie Incognito, who allowed just 15 pressures on 565 pass-block snaps at guard. However, both of those players have now moved on, along with left tackle Cordy Glenn, who has graded extremely well when healthy, especially as a pass-blocker. The 2017 Buffalo Bills may have been the second-best pass-blocking unit in the league, but the 2018 unit offers up more questions than answers. The Titans finished the regular season with a pass-blocking efficiency of 82.3, as they surrendered 126 total pressures on 553 passing plays. As a unit, they averaged 18.4 pass-block snaps per sack or hit allowed, which was the best mark among offensive lines. Heading into the 2018 season, the fans can get excited about their bookend tackles Taylor Lewan and Jack Conklin – who both performed at a high level last year, ranking 12th and 17th among tackles with PBEs of 96.5 and 96.2, respectively. After a stellar 2016 season that saw them rank second in PBE, the Raiders took a slight step back in 2017 and ended the season tied for third place. One of the main reasons for their success was the historic performance by center Rodney Hudson, who allowed a total of just three quarterback pressures all season and ended the campaign with a pass-blocking efficiency of 99.6, giving him the best mark ever recorded by a center. Earlier this spring, the Raiders made moves to improve their offensive line, as they released Marshall Newhouse, who ranked 56th among 81 qualifying tackles in PBE in 2017 and subsequently drafted his replacement – Kolton Miller – who ranked first among Pac-12 tackles in that same statistic. So, if the other key figures of the line stay healthy, the expectations continue to be high for the Raiders line in 2018. 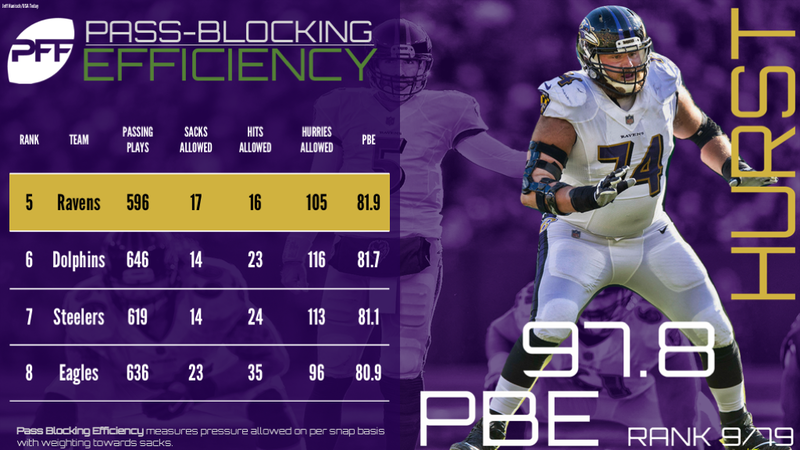 Throughout the 2017 season, the Ravens saw plenty of promising performances along the offensive line, of which allowed the unit to attain a PBE of 81.9, the fifth-best mark in the league. All told, they allowed the league’s fifth-fewest pressures (138) and averaged 18.1 pass-block snaps per sack or hit surrendered, which tied for the league’s second-best mark. Guard James Hurst had a great season as he finished ninth among guards in pass-blocking efficiency and allowed just one sack, one hit and 14 hurries all season. With the return of star guard and pass-blocking ace Marshal Yanda, who has averaged 1313 pass block snaps per sack allowed since 2015, the Ravens are in good shape heading into the new league year. The Dolphins offensive line saw the second-biggest improvement in 2017, after they raised their cumulative PBE from 74.6 in 2016 (25th among 32 teams) to 81.7 in 2017. Anchored by veteran center Mike Pouncey, who allowed just 12 total pressures over 608 pass-block snaps, the line averaged 46.1 pass-block snaps per sack allowed, the fourth-best mark among teams. 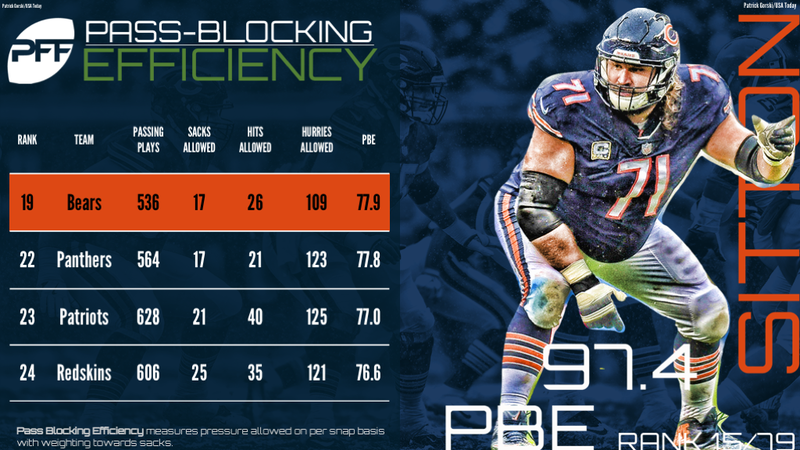 While the team released Pouncey in March, the Dolphins did sign guard Josh Sitton, who has proved consistent throughout his career being the only guard in PFF history to grade above 85.0 for nine consecutive seasons. Sitton’s pass-blocking prowess could be exactly what’s needed to keep the Dolphins near the top of this list. While they did allow 16 more pressures than they did in 2016, the Steelers offensive line remained successful at keeping their quarterback upright in 2017, as they averaged 44.2 pass-block snaps per sack allowed, the league’s fifth-best mark. The brightest performance on the line came from right guard David DeCastro, who was one of just three guards in the NFL to play more than 500 pass-block snaps without allowing a sack. His performance earned him our Matthews Award, an award given to the game’s best offensive lineman. Without many changes to the starting unit heading into 2018, the Steelers offensive line remains an area of strength for the team. The Eagles fielded one of the best offensive lines in the NFL a season ago. Their line play was a big reason their season culminated with a Super Bowl victory. All told, they allowed 154 quarterback pressures over 636 passing plays, which included just 96 hurries, the third-fewest surrendered by an offensive line. The unit was solidified by guard Brandon Brooks, who tied for seventh among guards during the regular season with a pass-blocking efficiency of 97.9. Brooks also saved one of his best games of the year for the Super Bowl, where he didn’t allow a single pressure. The return of left tackle Jason Peters should only bolster this unit in 2018, as they suffered a decline in pass protection after his injury, falling from fifth in PBE before his injury to eighth after his injury. 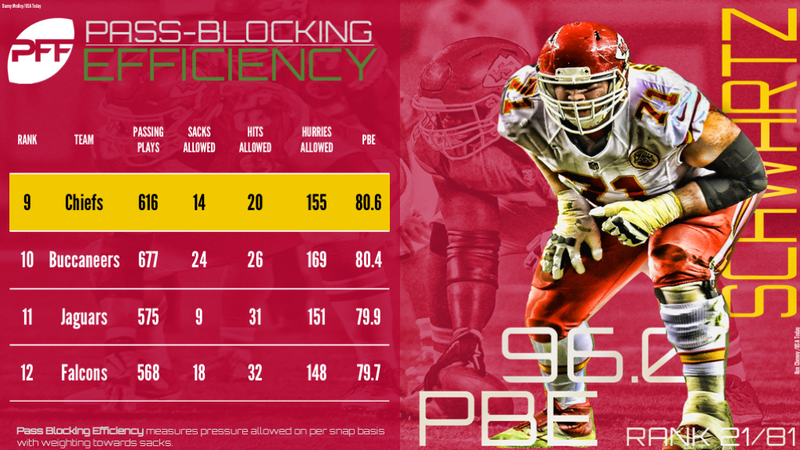 The Chiefs’ offensive line performed well in 2017, especially considering they had to overcome multiple injuries throughout the year. The unit surrendered 155 pressures on 616 passing plays, including just 14 sacks and they averaged 18.1 pass-block snaps per sack or hit allowed, tied for the second-best mark among offensive lines. Mitchell Schwartz continued to play well at right tackle, as his 96.0 PBE ranked 10th among 32 tackles that played at least 500 pass-block snaps in 2017. Schwartz averaged 19.3 pass-block snaps per pressure allowed and 102.7 pass block snaps per sack or hit allowed, ranking ninth and second among his peers, respectively. As it stands, most of the group will remain in place for the 2018 season and if they can stay healthy, a climb up the PBE rankings shouldn’t be out of the question. The Buccaneers offensive line finished as the sixth-most improved pass-blocking unit in the league last year, as they increased their cumulative PBE by 3.9 points from their 2016 mark of 76.5. Demar Dotson was a major reason behind this improvement. Dotson ranked third among the league’s tackles with a PBE of 97.6. Heading into the 2018 season, Dotson returns from injury, Ali Marpet moves back to guard after he struggled at center last season and the new addition of Ryan Jensen on the interior should bolster this unit even more, as Jensen allowed just 12 pressures on 596 pass block snaps last season for the Ravens. The Jaguars offensive line may rank 11th in overall pass-blocking efficiency from a season ago, but they were exceptional at preventing sacks last year. They surrendered 31 hits, 111 hurries but incredibly just nine sacks, which tied them with the Los Angeles Chargers for fewest sacks surrendered among offensive lines. Center Brandon Linder ended the year ranked second among centers with a PBE of 99.3 and did not allow a sack over 444 pass-block snaps. Right tackle Jeremy Parnell closed out the season as the only tackle in the NFL to play more than 400 pass-block snaps without allowing a sack. By adding guard Andrew Norwell in free agency, the Jaguars look even stronger going into 2018 as Norwell finished as the only offensive lineman in the NFL to log at least 500 pass-block snaps without allowing either a sack or a quarterback hit a season ago. The Falcons offensive line took a small step back in 2017 and allowed 18 sacks, 32 hits and 98 hurries on their 568 passing plays. Throughout the year, the Falcons saw good pass-blocking performances from guard Andy Levitre, who ranked 13th among guards with a PBE of 97.6, right tackle Ryan Schraeder, who ranked sixth among tackles with a PBE of 97.1, and center Alex Mack, who ranked 14th among centers with a PBE of 97.9. Heading into the 2018 season, the new addition of Brandon Fusco could prove to be an upgrade for the team at right guard as Fusco’s PBE of 96.5 bettered the marks of fellow Falcons guards Wes Schweitzer (96.0) and Ben Garland (92.9) last year. The Vikings offensive line was far from stable throughout the 2017 season and that lack of continuity took its toll on the passing game. The team ended the campaign with 154 pressures allowed on 572 passing plays, but it easily could have been more without the help of quarterback Case Keenum escaping sacks at an incredible rate. The bright spot on the line was guard Nick Easton, who allowed just three hits and nine hurries on his 401 pass-block snaps and finished one of just five guards to play more than 400 pass-block snaps without allowing a sack. With so much invested in new quarterback Kirk Cousins, the offensive line will need to improve their play heading into the new league year. The 49ers offensive line fielded the most-improved unit in football in 2017, as the team improved their pass-blocking efficiency from 71.7 in 2016 (29th of 32 teams) to 79.0 in 2017. One major reason for this was the outstanding play by veteran left tackle Joe Staley, who allowed just 24 pressures all season and ended the year with a PBE of 96.7, ranking 10th among tackles. Going into the 2018 season, the 49ers will certainly hope that the addition of rookie tackle Mike McGlinchey will help bolster the line, as McGlinchey allowed just 16 pressures on 411 pass-block snaps throughout his final season at Notre Dame. The Rams’ unit went from drastically underachieving in 2016 to becoming a strength of the team in 2017. The line allowed just 151 pressures on their 551 passing plays. Veteran free agent acquisitions John Sullivan and Andrew Whitworth both performed at a high level throughout the season, and both ended the year ranked 18th among their respective positions with PBE ratings of 97.7 and 96.1, respectively. While Whitworth showed slight signs of decline in 2017, he still ranks first among qualifying tackles over the PFF era with a career pass-blocking efficiency of 97.0. The Dallas Cowboys saw a drop off in production in 2017, having lost Ronald Leary and Doug Free prior to the season and left tackle Tyron Smith missing time due to injury. They allowed 19 sacks, 26 hits and 108 hurries on their 555 passing plays. Despite the cumulative setback, right guard Zack Martin continued his dominant play, as he allowed just 11 total pressures on 531 pass-block snaps, resulting in the highest pass-blocking efficiency among guards at 98.4. Heading into the 2018 season, the Cowboys hope that second-round pick Connor Williams can replace the production that was lost by guard Ronald Leary, as Williams allowed just 27 pressures on 932 pass-block snaps over the last three years at the University Of Texas. Where Williams plays in addition to their potential moves of La’el Collins is another story, and one that should be ironed out before Week 1 if they want to vault up this list. The Packers ended the 2016 campaign ranked first among teams with a PBE of 84.8, but 2017 was a different story, as their PBE rating of 78.2 saw them slide all the way down to 17th. This can be attributed to the fact that the Packers offensive line was one of the most fluid units in the NFL last year, with eight different players logging at least 100 pass-block snaps. The star of the show, as expected, was left tackle David Bakhtiari. 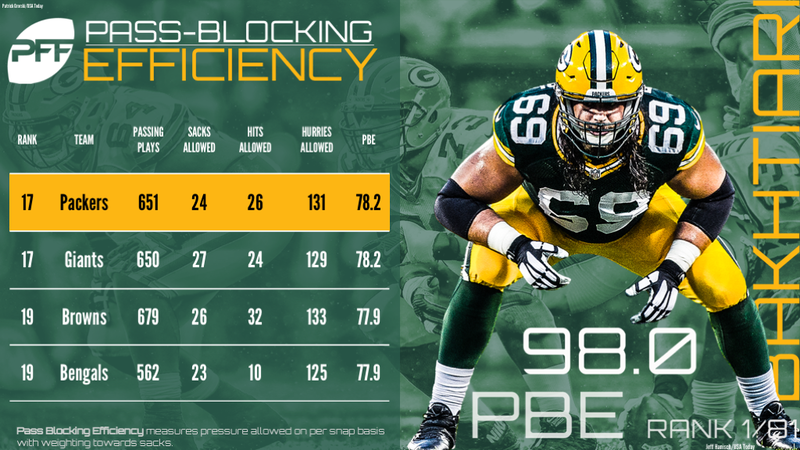 Over the course of his career, Bakhtiari has logged 2,900 pass block snaps, and if compared to tackles with at least 2,500 pass-block snaps during the PFF era, he’s allowed the ninth-fewest sacks (22), the fewest quarterback hits (16), the fewest quarterback hurries (95) and the fewest total pressures (133). The 2017 season was likely a blip on the radar for this talented unit and if they can stay healthy in 2018, you can expect them to be near the top of this list a season from now. Perhaps one of the most scrutinized units in the league, the Giants’ offensive line did nothing to end that scrutiny in 2017. They allowed the fourth-most sacks (27) and the 10th-most hurries (129) to go along with 24 quarterback hits, tallying a total of 180 pressures allowed. However, the Giants have made moves this offseason to make sure they improve in this area, signing former Patriots left tackle Nate Solder, who posted a 75.7 pass-blocking grade in 2017. Guard Will Hernandez will also help on the interior, as Hernandez allowed just four pressures over his past two college seasons combined. Despite investing heavily in their offensive line prior to the season, the Browns still struggled in pass protection and allowed the sixth-most total pressures (191) on their league-leading 679 passing plays. JC Tretter played well at center, allowing just 25 pressures all season, while incumbent left guard Joel Bitonio allowed just 24 pressures. Before his injury, left tackle Joe Thomas played up to his usual, exceptional standard, as he did not allow a sack on 300 pass-block snaps. After Thomas’ injury, pass protection became a liability on the edges. As we head into the 2018 season, the main question for the Browns will be, who, if anyone, can step into Joe Thomas’ Canton-bound shoes? Because of several crippling injuries, nine different players saw at least 100 pass-block snaps for the Bears in 2017. They gave up 152 pressures on 536 passing plays. The top performance came from left tackle Charles Leno Jr., who enjoyed the best season of his career and allowed just 24 pressures all season. Heading into the 2018 campaign, rookie guard James Daniels is pencilled in to fill the shoes of the recently departed pass-blocking star Josh Sitton. Daniels performed well in pass protection during his final college season, allowing just 10 pressures on 371 pass-blocking snaps at Iowa. Prior to the 2017 season, the Bengals chose to let free agents Andrew Whitworth and Kevin Zeitler walk away, which proved harmful as the Bengals offensive line allowed 158 total pressures on 562 passing plays. While the unit was relatively porous when it came to total pressures (they averaged 3.56 pass-block snaps per pressure allowed – the 14th-worst mark in the league), they were relatively successful at keeping their quarterback on his feet and allowed just 10 QB hits all season, the fewest among all offensive lines. Left guard Clint Boling was a standout performer as he ended the season ranked fifth among guards with a pass-blocking efficiency of 98.0 and allowed just 12 pressures on 474 pass-block snaps. Heading into the 2018 season, the Bengals have added left tackle Cordy Glenn with hopes he can re-stabilize the position, as Glenn has racked up a career PBE of 95.8 over his time in the league, the 10th-best mark among all tackles with at least 2,500 pass-block snaps over the last 12 seasons. The Panthers saw a wide range of performances in 2017, ranging from very good to relatively underwhelming. All told, they allowed 161 pressures on 564 passing plays, which led to a pass-blocking efficiency of 98.3, ranking 22nd among offensive lines. Guard Andrew Norwell, who was signed by the Jaguars this offseason, played extremely well, allowing just 13 hurries all season and earning a pass-blocking efficiency of 98.3, the second-best best mark among qualifying guards. Replacing that kind of production will be a tough ask, but the Panthers will hope that Jeremiah Sirles is up for the challenge. Sirles only played 120 pass-block snaps last season, but performed well, allowing just eight pressures. The Patriots’ offensive line started relatively slow but gradually showed improvement as the 2017 season went on. They allowed 186 pressures on 628 passing plays this season, with 40 of those pressures allowed being quarterback hits, the most allowed by an offensive line. Throughout the season, the Patriots saw an encouraging performance from young guard Shaq Mason, who allowed just 26 pressures on 628 pass-block snaps. Going into 2018, the Patriots will hope that rookie guard Isaiah Wynn can help fill the void left by departed left tackle Nate Solder, after Wynn allowed just five pressures from his 328 pass-block snaps in his final college season. A few offensive lines were held back by injuries in 2017, but none were more injury-riddled than the Redskins, who had 12 different players play at least 50 pass-block snaps throughout the season. All told, the Redskins surrendered 181 pressures on 606 passing plays, including 35 QB hits, the fifth-most among offensive lines. There were bright spots, however, as left tackle Trent Williams, despite playing with an injury, proved once again that he’s one of the best offensive tackles in football by being the only left tackle in the league to register 350 pass-block snaps without allowing a sack. The Redskins also got a nice rookie season from center Chase Roullier, who ended the campaign with a pass-blocking efficiency of 98.4, the highest rating recorded by a rookie center since Nick Mangold (99.4) in 2006. If they can stay healthy, the Redskins have the making of one of the better offensive lines in football as we look ahead to 2018. 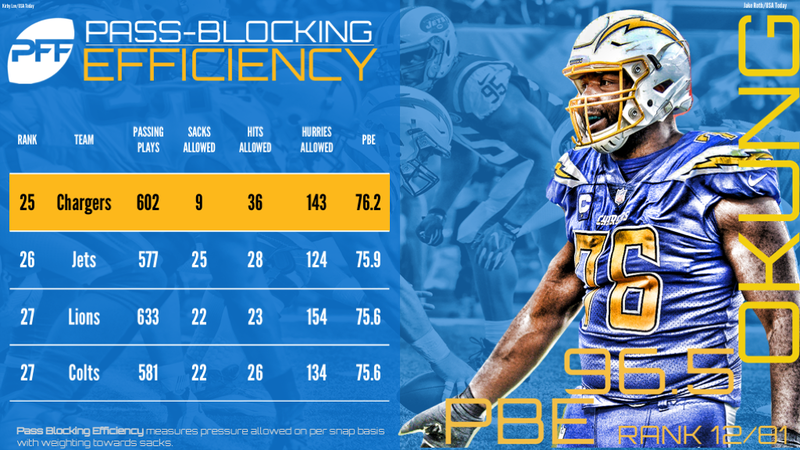 Prior to the 2017 season, the Chargers made strengthening their offensive line a priority, as they signed left tackle Russell Okung and drafted guards Forrest Lamp and Dan Feeney. While Okung performed well and ended the campaign ranked 12th among tackles with a PBE of 96.5, Lamp suffered a season-ending injury early on and Feeney struggled to find his feet in his first year. The Chargers offensive line ended the season having allowed 188 pressures on 602 passing plays, but the unit only gave up nine sacks, although that probably says more about quarterback Philip Rivers’ escapability rather than their cumulative pass-blocking prowess. The Jets ended the 2017 season ranked 26th among teams with a PBE of 75.9, having allowed 177 pressures on 577 passing plays. Included in those pressures were 25 sacks, the sixth-most in the NFL, averaging one sack surrendered every 23.1 pass block snaps, the fourth-worst rate in the league. However, there were some positives as the Jets did see a promising season from Kelvin Beachum, who allowed just 29 pressures on 577 pass-block snaps, resulting in a pass-blocking efficiency of 96.1 – the 18th-best mark among tackles. The Lions made key additions to their offensive line prior to the 2017 season, adding right guard T.J. Lang and right tackle Rick Wagner. Both proved to be good investments, as Lang posted a 97.3 PBE, finishing 18th among guards, and Wagner allowed just five combined sacks and hits on 476 pass-block snaps. However, the investment wasn’t quite enough, as the Lions surrendered 199 pressures on 633 passing snaps, the fifth-most among teams. Looking toward the 2018 season, the Lions hope the addition of rookie offensive lineman Frank Ragnow will solidify the left side of the line, as Ragnow ended his final college season ranked second among draft-eligible centers in pass-blocking efficiency (99.6). The Colts fielded the fourth-most improved offensive line from 2016 to 2017, as the Colts increased their PBE by 6.1 points. This is proof that the Colts, considering their historically bad offensive line in 2016, are at least trending in the right direction. The best individual pass-blocking efficiency came from center Ryan Kelly, who allowed 11 pressures on 230 pass-block snaps and didn’t allow a sack all season. The addition of rookie guard Quenton Nelson, who has been pegged as a once-in-a-generation talent, should bolster the Colts’ offensive line. Nelson allowed just five pressures on his 411 pass-block snaps during his final college season. For the second-straight year, the Seahawks feature near the bottom of this list. During the 2017 season, they allowed 19 sacks, 28 hits and a whopping 162 hurries, which was second only to the Houston Texans. 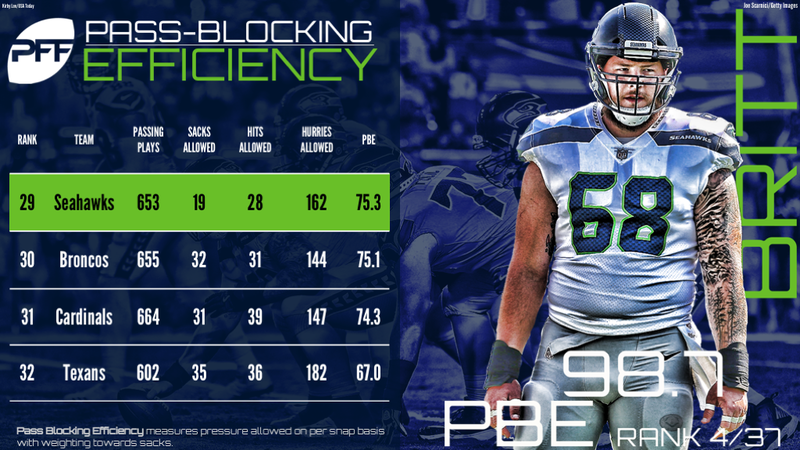 Their season was plagued with pass-blocking woes, but there were some bright spots, as center Justin Britt allowed just 11 total pressures (nine hurries, one hit, one sack) on 651 pass-block snaps and left tackle Duane Brown ended the year with a pass-blocking efficiency of 97.0, ranking seventh among tackles. Whether Brown can continue his strong performance remains to be seen. Seattle must hope for some serious player turnarounds as they did not complete many moves this offseason with eyes towards improving their pass-blocking unit from a season ago. The Broncos offensive line allowed a whopping 207 quarterback pressures in 2017, which included the league’s second-most sacks (32), the 11th-most hits (31) and the fifth-most hurries (144). Throughout the season, the unit really struggled at keeping their signal-caller upright and averaged 20.5 pass-block snaps per sack surrendered, the league’s second-worst rate. Bright spots were few and far between, but center Matt Paradis’ consistency was certainly one of those bright moments, as he ended the year ranked in the top 15 in pass-blocking efficiency. Arguably, the Cardinals struggled at every position along the line in 2017, with seven different offensive linemen having allowing two or more sacks throughout the season. All told, the team surrendered 217 total pressures on 664 passing plays, resulting in a PBE of 74.3 – the second-worst mark in the league. In terms of pass-blocking efficiency, the Cardinals best performer was center A.Q. Shipley, but even he surrendered five sacks on the season, which was more than any other center in the NFL. Last on this list are the Texans, who fielded a historically bad offensive line in 2017. 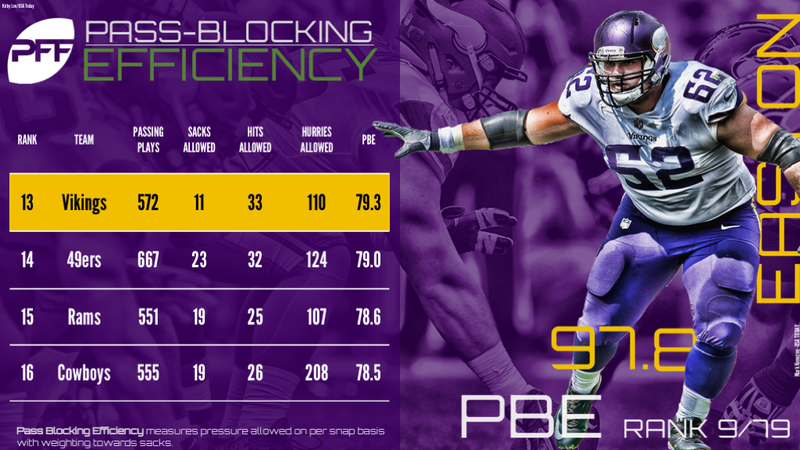 They allowed the most sacks (35), the third-most hits (36) and the most hurries (182) among NFL offensive lines, ending the year with a cumulative pass-blocking efficiency of 67.0 – the lowest mark ever recorded in the PFF era. To go along with that, the Texans allowed one pressure every 2.38 pass-block snaps, one sack every 17.2 pass-block snaps and allowed their quarterback to get either sacked or hit once every 8.5 pass-block snaps, all of which rank dead last among the league’s offensive lines. Heading into the 2018 season, it can only get better.